We've covered here on MiniPCDB how Zidoo managed to get a name for themselves in just one year - to illustrate this you just have to look how Zidoo X6 Pro became the most sought-after RK3368 Mini PC. We've also covered the specs and the unboxing on previous articles, but just in case you didn't read them, Zidoo X6 pro is a Android 5.1.1 Lollipop device using Rockchip 3368 Octa-core 64-bit processor which supports 4K*2K H.265/H.264 hardware decoding, has HDMI 2.0, Gigabit Ethernet and Wi-Fi 802.11ac. OK, so X6 Pro has on paper the greatest potential among it's RK3368 competitors, but does it live up to the expectations? Our review will try to answer this very question. Zidoo X6 Pro can be purchased from Amazon . As usual, Zidoo provides everything you need to set it up - except the batteries for the remote. Just connect the power adapter and HDMI cable and you are ready to go. Boot time is reasonable - around 20 seconds without any peripherals and one minute at most with all ports in use. The main launcher interface is a custom one designed by Zidoo ("ZIUI"). This one is tile-based, with Kodi taking a sizable portion on the menu (as expected). There's a built-in app cleaner and even a "parental control" setting that allows you to password protect some apps. One interesting feature is the "auto power off" feature, which allows you to power it off or put it into standby after a predefined amount of time (in 30 minutes increments). If you want to power it off right away you need to press the red button on the remote for 3 seconds. 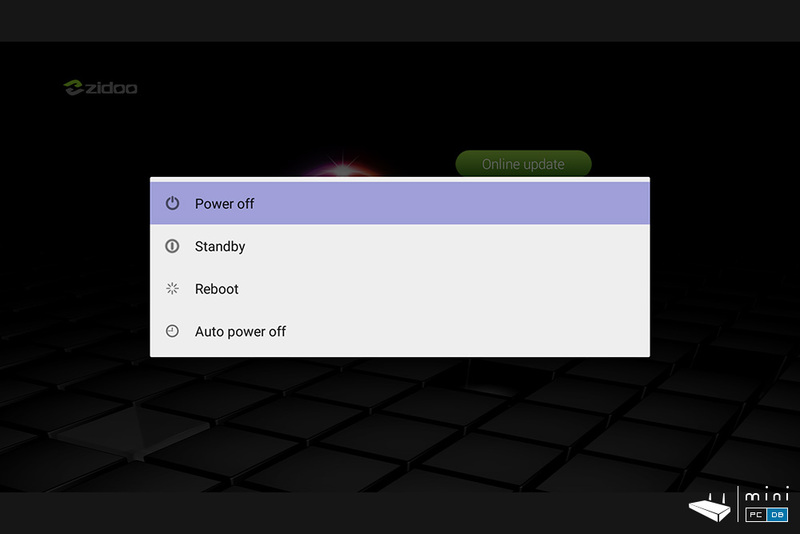 Pressing it just once brings the PowerOff/Standby/Reboot/Auto power off menu. 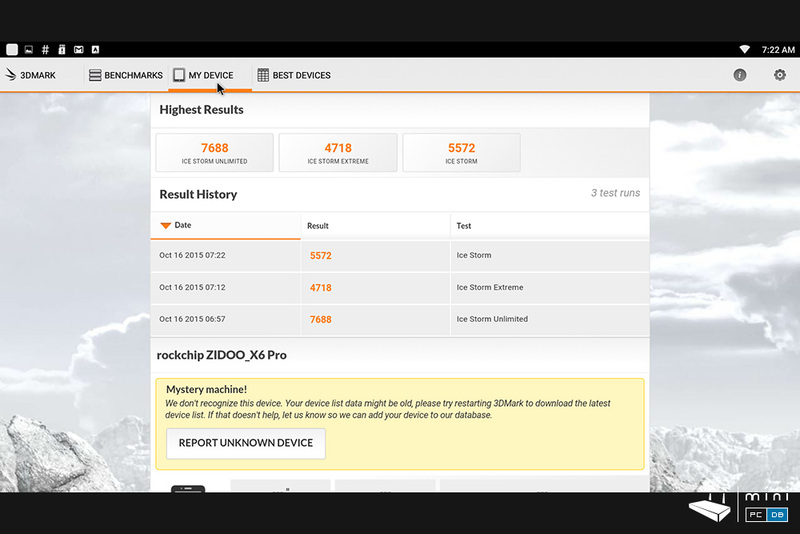 Zidoo is one of the few manufacturers to offer regular firmware updates (the other two models got several updates each) - and updating your Zidoo device is quite easy as it can be done over-the-air (OTA). Firmware updates are firstly published on their forum and after a few days they are published on Cloudfront CDN services from where they get to your device nice and easy. 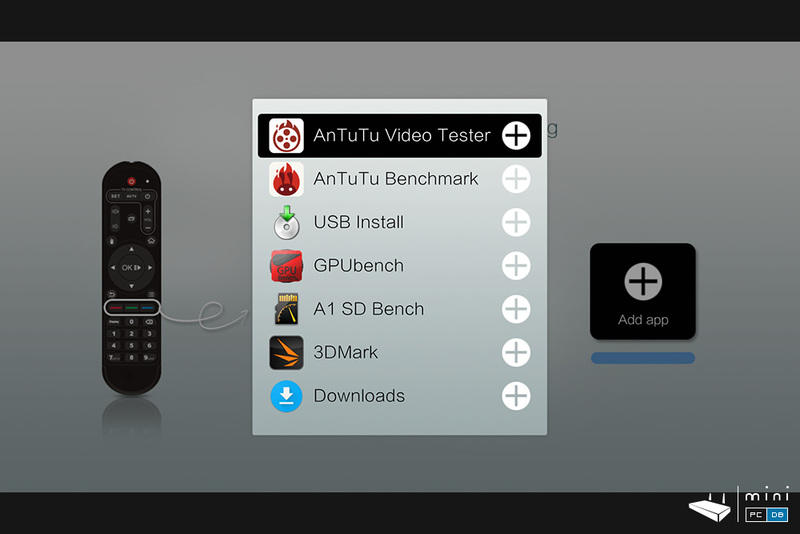 If you don't want to wait for the update to be loaded on CDN, you can download the update file, save it on a USB stick, connect the stick to the X6 Pro and start the update app, choose Local update and follow the instructions. 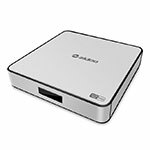 The Mini PC will process the update and restart itself, nice and easy. The X6 Pro comes with a small IR remote (same one used for Zidoo X1). The remote is simple, well balanced and has all the keys you usually need to control a TV box. It's not an airmouse, but you do have a "mouse mode", where you can move the on-screen cursor using the arrow keys...if you're really that patient. As with all Zidoo IR remotes, this one has also a nice perk : you can use it to control your TV as well as it has several programmable keys. 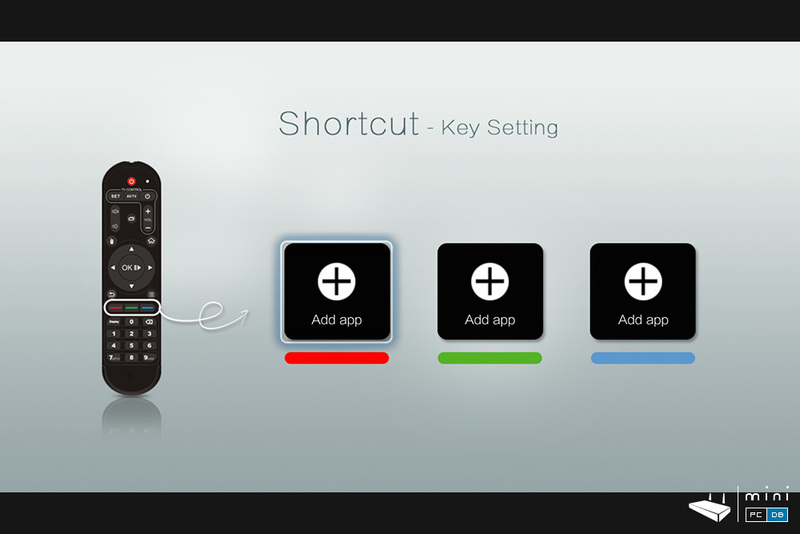 Below the arrow keys there are three coloured keys which you can use to launch an app and Zidoo promised they could be used in Kodi as well (one of them could be used, for instance, as the missing "Stop" button). 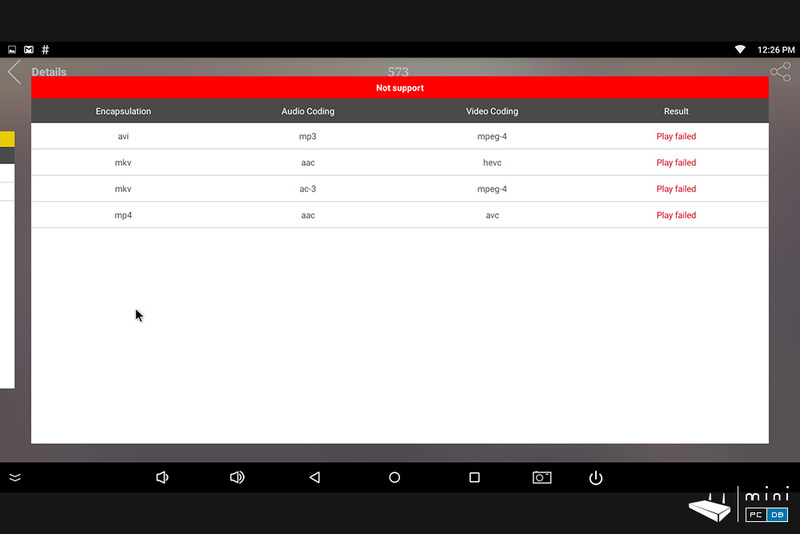 If you have a Harmony remote, you can use it to control your Zidoo X6 Pro as Zidoo pushed the codes already. You can also use a mouse, USB keyboard or an airmouse if you have them around. 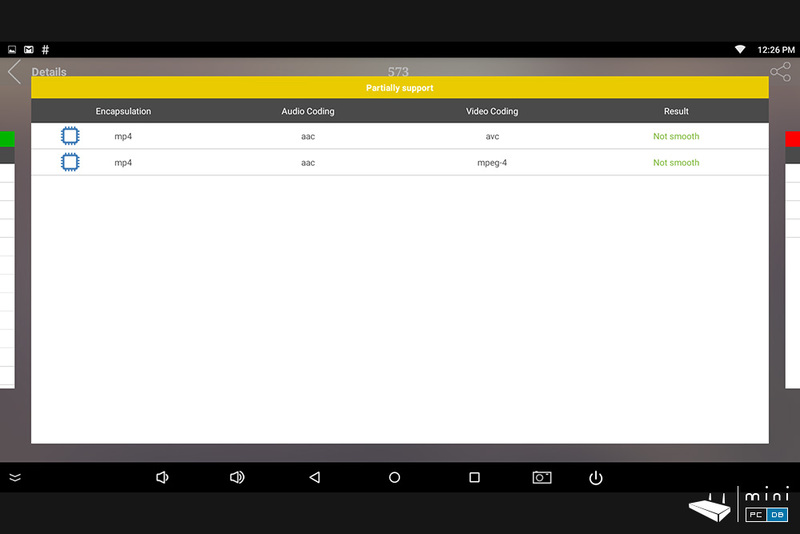 But if you have an Android-based smartphone or tablet you should definitely try Zidoo RC remote app which is easy to use and might just be what you're looking for. I try to keep this review as short as possible so we won't cover Zidoo RC app again because we did so extensively on the Zidoo X9 review. Oh, the benchmarks! No respectable review should go without them, isn't it? 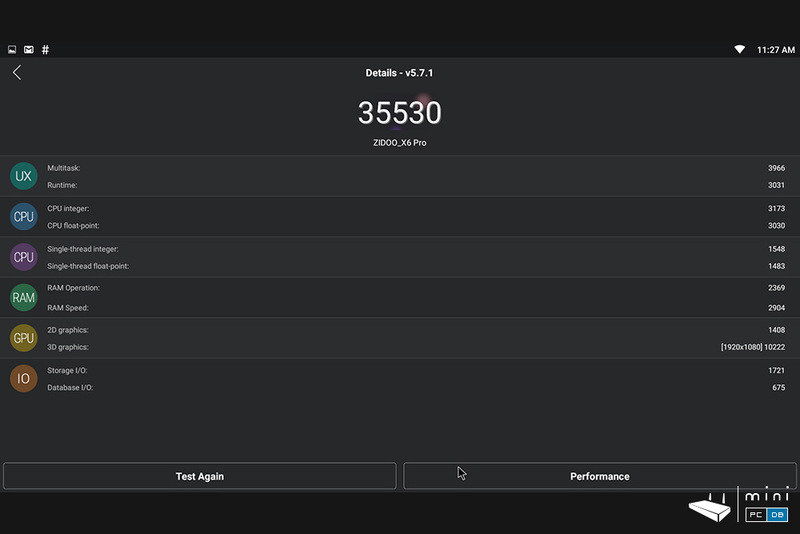 For some unknown reason AnTuTu results were different each time I tested, best result was above 35000 while the lowest was just above 30000 points. Even so, the results were much better than I've seen on other reviews, so maybe the firmware update did the trick. 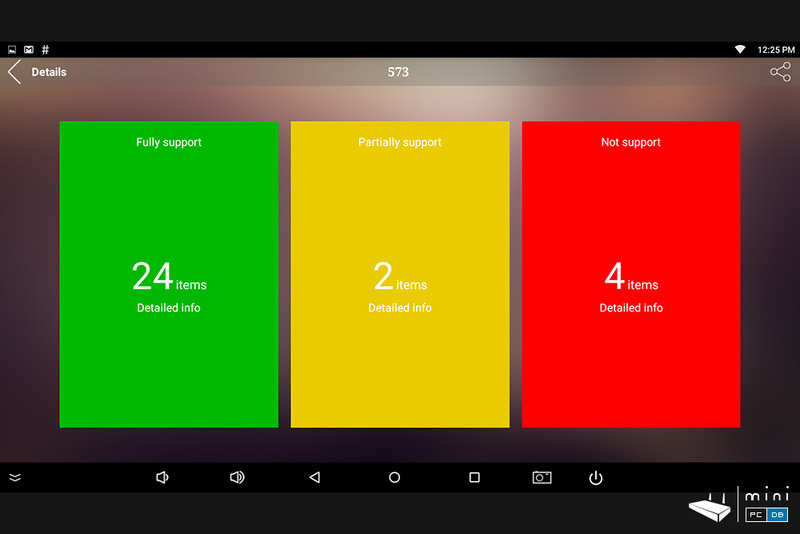 In Antutu Video Tester Zidoo X6 Pro got a decent result - 530 points with 24 out of 30 formats fully supported. 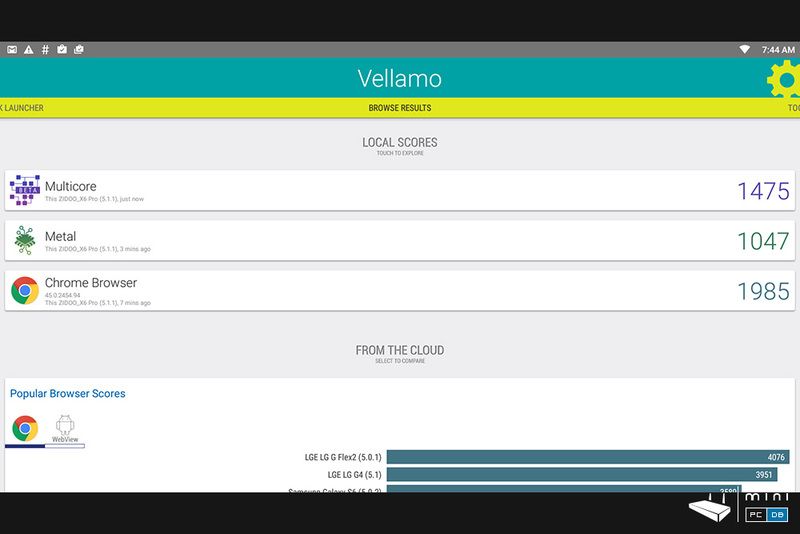 In Vellamo Zidoo X6 Pro got 1475 points for Multicore, 1047 for Metal and 1985 points on the Chrome browser test. Again these results were pretty different from what other reviewers got on the same test. A1 SD Bench was used to test internal storage and RAM. Results were quite good: 85MB/s read and 25MB/s write on Internal memory and ~2650MB/s RAM copy speed. 3DMark yielded good results as well: 7688 points for Ice Storm Unlimited, 4718 for Ice Storm Extreme and 5572 points on Ice Storm. You might have noticed that all Android TV boxes launched this year have something in common (besides the "4K" you get to see everywhere) - they all include Kodi. But most of them just pre-install the APK and add the XBMC logo on their sales pitch and call it a day. Zidoo have done much more than that : Zidoo X6 Pro comes with a modified version of Kodi 15.1, first RK3368 Android TV box to do so. And they are releasing the source modifications for Kodi, which is quite uncommon amongst Chinese manufacturers, as explained here. 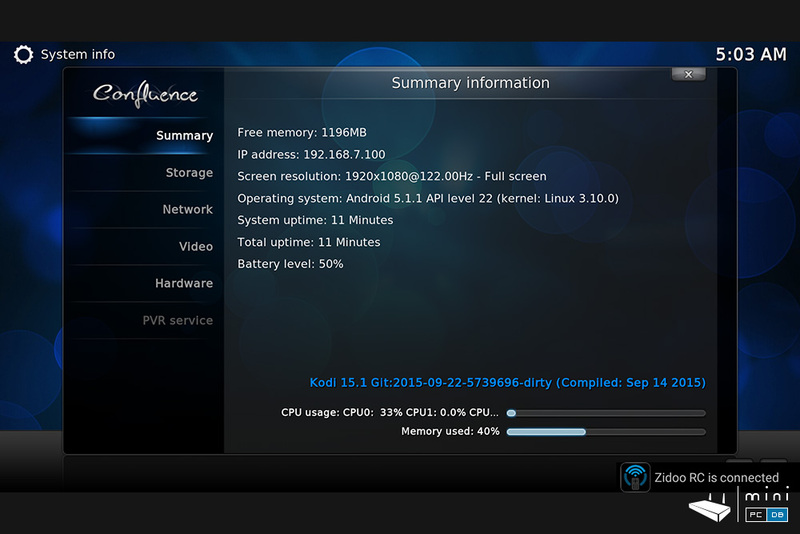 Not surprisingly, most test files worked OK with both Kodi and MX Player and the image quality is above average. But we'll have to wait for the next firmware to get 23.976Hz output. Playing 60Mbps files through wi-fi from a Samba share is possible with X6 Pro. HD audio passthrough works just fine for most formats (DTS-HD, TrueHD, even Dolby Atmos). Zoom function in Kodi is disabled for some reason. Zidoo's dev team managed to get hardware decoding working, added 3D MVC support and 7.1CH HD Audio passthrough and they won't probably stop here! Zidoo X6 Pro is a small device that comes with impressive specs (HDMI 2.0, Kodi Isengard with [email protected] support) and that can be used as multi-purpose living room mini PC for movies, light gaming, even for Skype (with a UVC USB camera). It might be a little more expensive than the rest of the RK3368 devices out there - for the reasons explained here, but it's still an affordable way to get your video content (4K or not) on the big screen TV. There are some improvements to be made for 3D movies (frame-packing, 3D-ISO playback) and 23.976 are still rendered as 24.00Hz, but Zidoo promised to solve these in the a future firmware update. The units gets rather hot under stress, but I've found that using a cooling pad or simply turning it upside down gets things under control. Improving the airflow with some rubber feet also helps. All of this points to Zidoo X6 Pro being a very good option for a mid-range Mini PC.